"That's a silly question," Goose honked. "It is a big egg, of course." "Of course it is an egg. I know that!" huffed Duck. Duck and Goose encounter a round, spotted object that vaguely resembles an egg. They squabble over the "egg," each declaring ownership. Finally, after much fuss, they sit side by side on top of the egg, waiting patiently for it to hatch. In due time, a little blue bird comes along and offers an interesting explanation as to the identity of the "egg." Even though the book is not exactly about an egg, it tops our list because it provides a sweet and humorous lesson about working together as friends. We first saw this book mentioned on Almost Unschoolers and immediately bought our own copy afterward. "All the birds had laid and egg. All except for Duck. Then Duck found an egg!" A male duck feels left out because all the other birds have laid eggs. Then he finds a glorious large egg with green spots. The other birds make fun of him, and celebrate gleefully when their eggs hatch "Creak-Crack" one-by-one. Duck never gives up hope and finally with a surprising CREAK-CRACK-SNAP, Duck's egg hatches, sending all the birds into a frightened flurry. Gravett's book is very clever, both in design and plot. The center part of the book where the eggs hatch is so neat! In pages of graduated size, all the eggs are lined up, each egg hatches one-by-one and you turn each segmented page to view the mother's response. The surprise ending delighted my children, though I suppose it could scare sensitive children. "George knew something wasn't right when he found more than he had bargained for under his mother's favorite chicken." A boy named George makes a surprising discovery when he finds a large, golden colored egg in the henhouse. 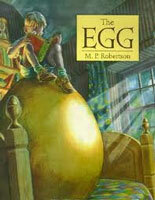 He moves the egg into his bedroom and tends to it by reading aloud egg stories. Three days later the egg hatches and a dragon emerges! George decides to play the role of "mommy" and teaches the dragon important dragon skills like flying, breathing fire, and the art of fighting a knight. Despite the fact that they are unable to speak the same language, boy and dragon develop a special bond and even separation can't break that bond. The illustrations in this fantasy book are marvelous, especially the exquisite moonlit scenes! The Egg is a wonderful book for children that enjoy fantasies and dragon stories. The other books in the series include The Great Dragon Rescue, The Dragon Snatcher and The Dragon and the Gruesome Twosome. Do any other "strange egg" books come to mind? We'd love to read them! I just love Odd Egg... and all of Gravett's books, really. We have a wonderful book about an egg called Birds (A Big, Bigger, Biggest Book, a Fold-Out Poster Book) by Marie Aubinais. We haven't read The Egg, but we have read all of the others. I love Duck and Goose! Too bad about your weather. We had our egg hunt last weekend and lucked out with nice weather. The past few years we froze! 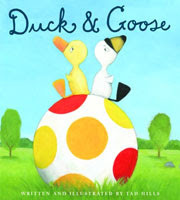 We've read Duck and Goose, but this Egg one looks cute! We'll have to find it. Thanks for sharing. What a great assortment of Egg Books. I love DUCK AND GOOSE and Tad Hill is one of my favorite kids book authors/illustrators. That stinks about your weather! This is such a cute collection of stories :) I need to check out The Egg from our library...I know I've seen it before, but bypassed it. It definitely sounds like one I should pick up next time. 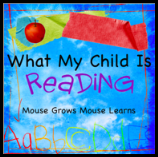 What about The Golden Egg Book by Margaret Wise Brown? The Egg looks gorgeous - I have to check it out. Thanks for joining the other great stories with WMCIR - we also enjoyed them a lot. I thought Duck and Goose was hilarious.